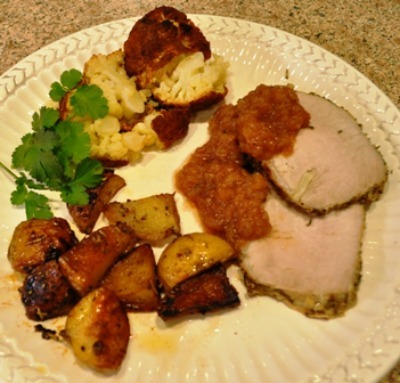 Roasted Pork Loin with Garlic and Potatoes Recipe is a beautiful dish that is very company worthy. My family likes it served with homemade applesauce and cinnamon. The potatoes crisp up to a beautiful golden brown, crispy on the outside with a buttery center. This is very tasty served with Whole Roasted Cauliflower with Moroccan Spices and homemade applesauce. 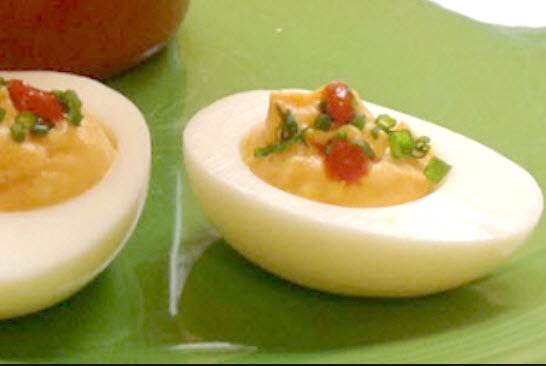 This wonderful recipe, comments, and photos was shared with my by Karen Calanchini, Food Stylist and Photographer, of Redding, CA. Make slits on both sides of the roast, with the tip of a sharp knife. Insert the halved garlic slices into the slits. Place the roast, fat side down, on a 9- by 13-inch baking dish lined with non-stick aluminum foil wrap. Mix the remaining diced garlic with 1 tablespoon of the chopped rosemary leaves, salt, pepper, and just enough olive oil to make a spreadable paste. Rub this mixture all over the pork, plus the ends. Place potatoes into a large bowl, drizzle with olive oil and then sprinkle salt, pepper, and remaining 1 tablespoon of chopped rosemary. Place potatoes around the pork loin. You may refrigerate at this time until you are ready to place in the oven. Place prepared pork roast and potatoes in the oven and cook for 30 minutes. 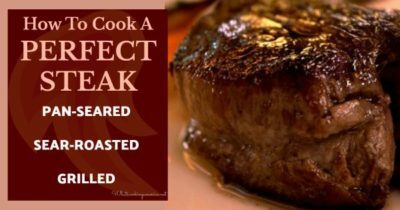 Turn roast to fat side up and cook another 25 to 30 minutes or until a meat thermometer inserted into center of roast reaches 155 degree F.
Remove pan from the oven and remove the cooked roast to a cutting board. Covered roast lightly with aluminum foil and allow to rest at least 10 minutes. Meanwhile mix cooked potatoes into the resulting meat juices in the pan and place back in the oven to crisp just to a golden brown. When ready to serve, slice pork roast and arrange on a dish or serving platter surrounded by the potatoes. Garnish with some rosemary sprigs, if desired.